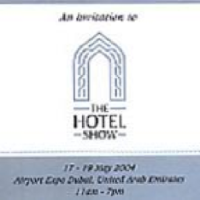 INTERCARE Group of Companies took great pleasure in inviting you to the "Hotel Show 2004 Exhibition" that will took place at the Airport Expo from 17th May to 19th May 2004 - Monday 17th May to Wednesday 19th May 2003: 11 am to 7pm. The Intercare Group demonstrates a flexible approach in its different divisions. The Contract Furnishing Division supplies quality products for 5-Star Hotels, amongst them, recently being Fairmont Dubai, Dusit Dubai & Emirates Towers Hotel. 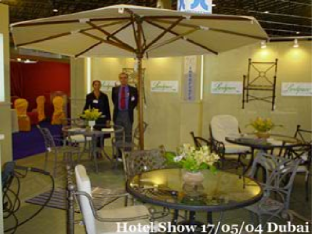 Now Intercare joins hands with Landgrave Furniture for Outdoor Furniture for Hotels, Shopping Malls, and Public Areas. Intercare Contract Furnishing Division is considered one of the most advanced companies in the area, with fully air-conditioned upholstery section and equipped with up-to-date machinery to provide the highest standards of quality in the furnishing sector. Intercare exhibited Altro Safety Flooring, used in most 4 and 5-Star hotels in the kitchen, stewarding and laundry areas.